It was one of the coldest weather on Dec. 5. 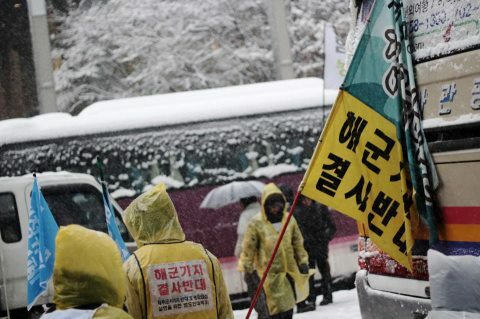 While the people’s sit-ins are ongoing in Gangjeong and Seoul near a month by now, people in both regions had to fight with cold weather that accompanied heavy snow (Seoul) and sleets (Gangjeong) in strong wind. Otherwise the village association entered judiciary measure against the navy, companies and Island government, regarding environmental destruction. 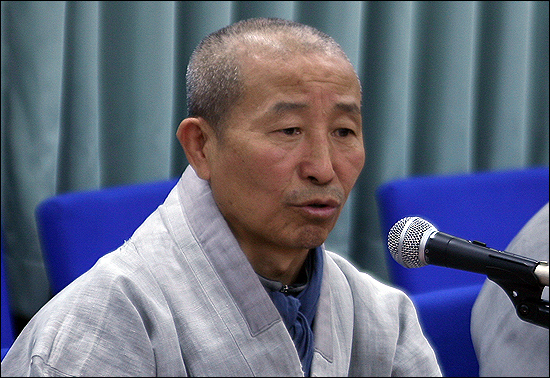 A good news is that Buddhists made public their large size mobilization for care of Gangjeong. Otherwise, 333 intellectuals made a statement opposing Park Geun-Hye, the Presidential candidate of the ruling conservative Saenuri party, with concerns on the possibility of returning back of Yushin dictatorship. For the details of each, see the below. In Seoul, the struggle in such bad weather was highlighted though in solidarity by the people who are opposing against naval base, who joined the emergency press conference by the workers and bereaved families of the victims of the Samsung industrial disease in front of the Samsung headquarter in Gangnam, Seoul. On the day that Samsung chairman’s only son was promoted to vice chairman. See an article, here. The Samsung General Union had called for solidarity upon the Samsung’ security workers’ violence on one-man protesters on Nov. 30, the day of the 25th anniversary event commemorating the inauguration of Lee Gun-Hee, President of Samsung. For more detail, see here. 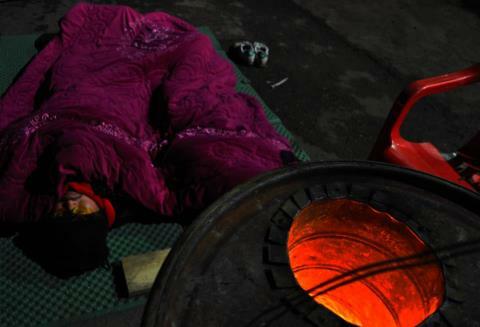 The venue was in front of Samsung headquarter, Gangnam, Seoul, where even long-time staying tenants are ready always to be evicted by the corporate greed. 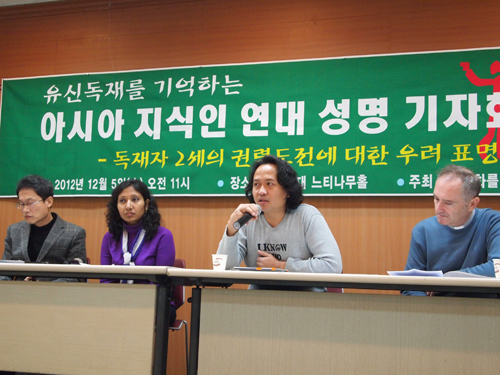 Photo by Samsung General Labor Union, Dec. 5, 2012. 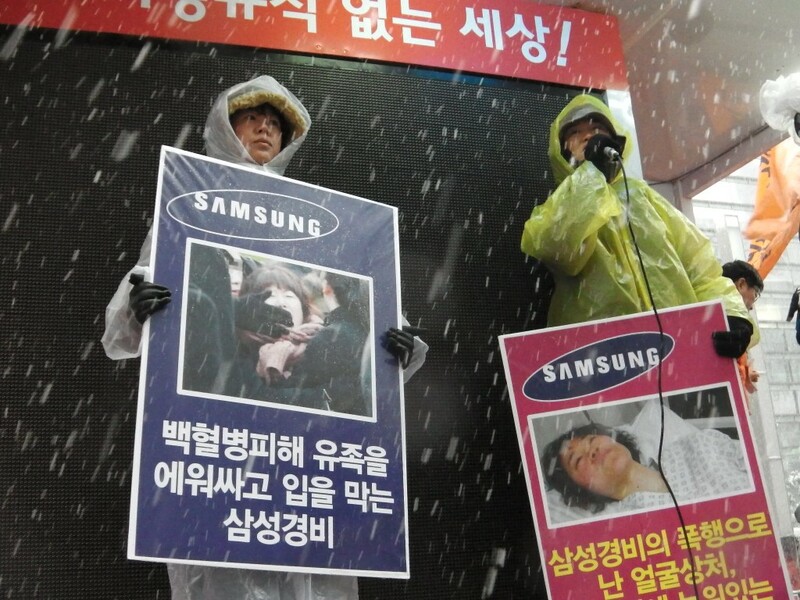 The protesters held the images of victims by Samsung on Nov. 30, in the emergency rally, in front of the Samsung headquarter, Gangnam, the richest district of Korea. 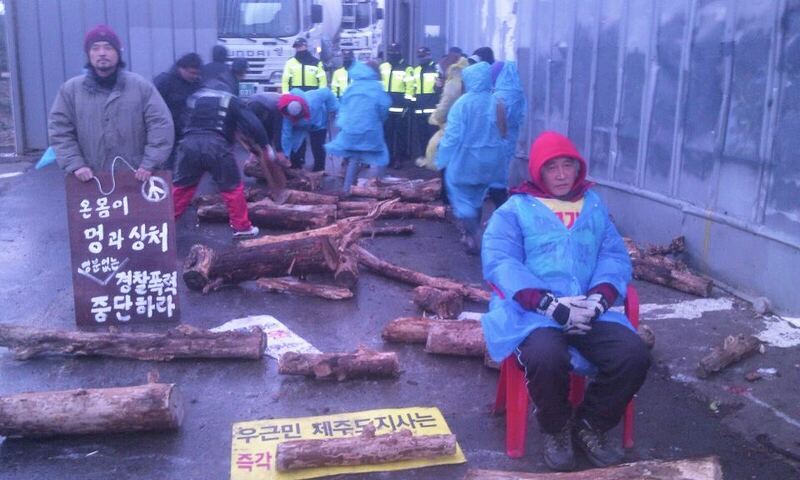 For more photos, click here(Samsung General labor Union) or here(Photos by Lee Wooki). 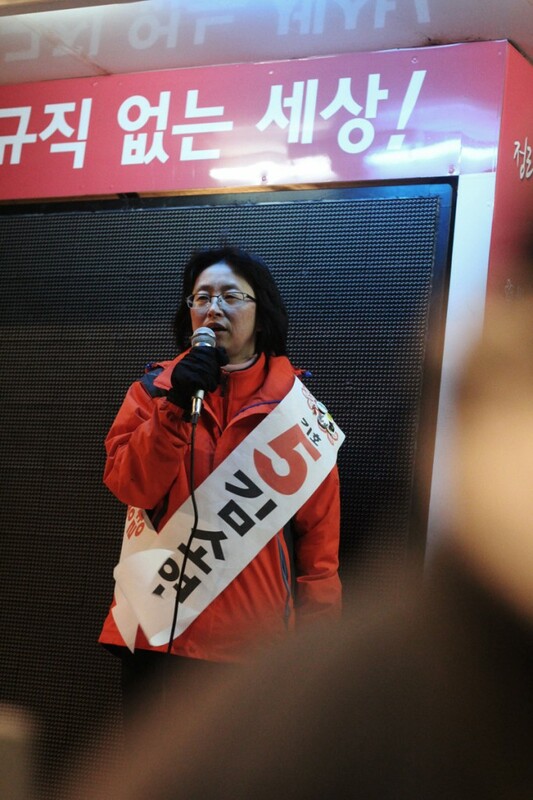 Kim So-Yeon, a leader of legendary Kiryung workers’ struggle and now Workers’ Presidential candidate also shined people’s protest. Still the people’s struggle would meet the Samsung’s counter-rally in which the Samsung seemed to have mobilized its workers who are not actually willing to be. The Samsung also mobilizing the police even interrupted Kim’s election campaign. Photo by Lee Woo-Ki, Workers’ Presidential candidate, Kim So-Yeon. For more photos, click here. Following the Dec. 4 TV debate held by three Presidential candidates of the ruling, main opposition, and opposition parties, there was another TV debate for three minority Presidential candidates who belonged to non-party on Dec. 5. Among the three, Kim So Yeon represented Workers. Kim Soon-Ja represented cleaning workers. Park Jong-Sun is a conservative. The other candidate, Kang Ji-Won was absent in refusal of the debate form in which major and minority candidates were differentiated. “Tonight, streaks of snow fluttered. The SNS was all covered with shouts of joy. However, I was not so glad. My heart is likely to fall down with pains. Following its official letter to the Island government on Nov. 20, the village association entered on judicial measure against the navy-side and Island government on Dec. 5. The Original Korean statement of the below translation can be seen here. Title: Is the navy harmful insect that gnaws on the value of the Jeju to enforce the construction even in violation of the agreed items in the Environmental Impact Assessment again following the general unreliability of the Jeju naval base construction? 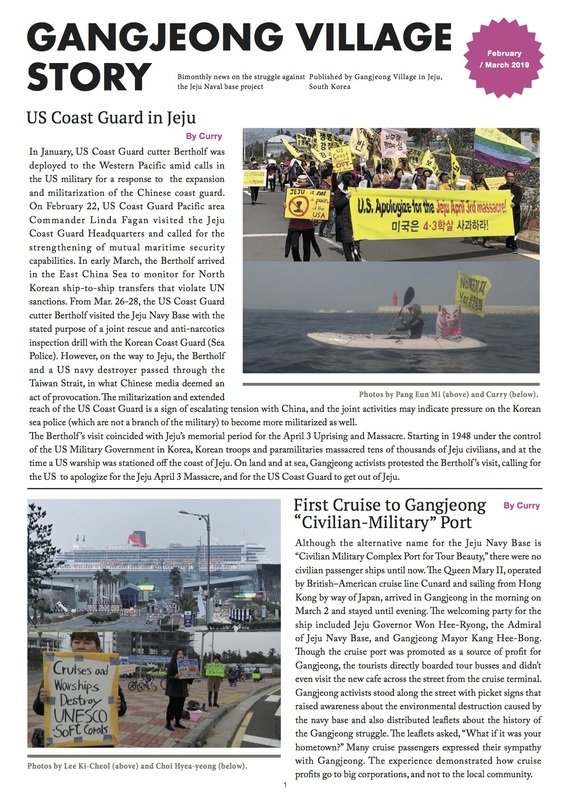 The Jeju naval base project committee installed silt protectors on the sea with half a heart because of the protests by the village Association and environmental groups when it started maritime construction without installing stationary silt protectors on the sea in the beginning of last year. Even with those facts, it is already enough for the Jeju Island government to take a measure of the business suspension to the applicable enterprises. It is right to say that it is possible for the Jeju Island government to take a measure of business suspension to the applicable enterprises and cancellation on the superintendence committee’s registration, which is more than the measure of negligence fines against them, added of its records of directions to the navy on the installation of silt protectors four times and of repeated directions twice following the none-carried directions. The Jeju Island is proud of its heaven-blessed nature. The Seogwipo maritime environment is the only UNESCO-designated maritime Biosphere Reserve in Korea and the Gangjeong Sea is of the habitat of soft coral, ROK Government-designated natural memorial No. 442. It is the start point that made the Jeju Island as the UNESCO triple-crowned and Seven Nature of the World. 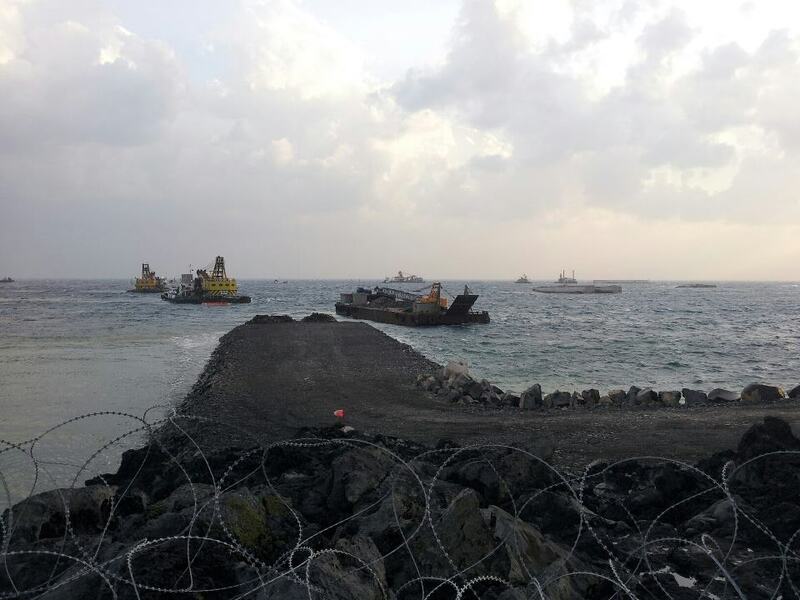 Is not the navy like harmful insect that gnaws on the value of the Jeju to enforce a large-size construction in such place even in violation of the minimum agreed items on nature protection? We have clearly stated that, if the Jeju Island government does not strictly punish on such destroying behaviors, we would take a judicial measure even against- not to mention the navy, navy-contracted construction companies-the Jeju Island government responsible for unreliable execution on the duty of management and supervision [on the navy and its contracted companies]. On Nov. , the Village Association has requested the Jeju Island government to give the navy direction on execution, submitting it with the proofs on the navy’s illegal construction (destruction). And the Jeju Island government notified us that it has sent its official letter to the MND and EA on the date of Nov. 30. However, in the Gangjeong Sea, illegal construction is still being committed. Thereupon, the Village Association states that it entered the judicial measure thanks to the MINBYON (Lawyers for Democratic Society), against the navy, navy-contracted companies, superintendence committee and Jeju Island government, along with sending the Island government an official letter that demands it strong administrative measures such as the imposition on the negligence fines. We warn again the navy that dares various law-evasiveness and unlawfulness, being blinded only for securing 2012 budget. The navy should immediately stop the construction (destruction) that destroys the environment of Jeju while staging a fraud play of ‘Civilian-Military Complex Port for Tour Beauty,’ which is a nonsense. And it should bear in mind that there would be only a disgrace of judicial judgment along with people’s, if it does not take steps for re-examination on the project along with apology to people. 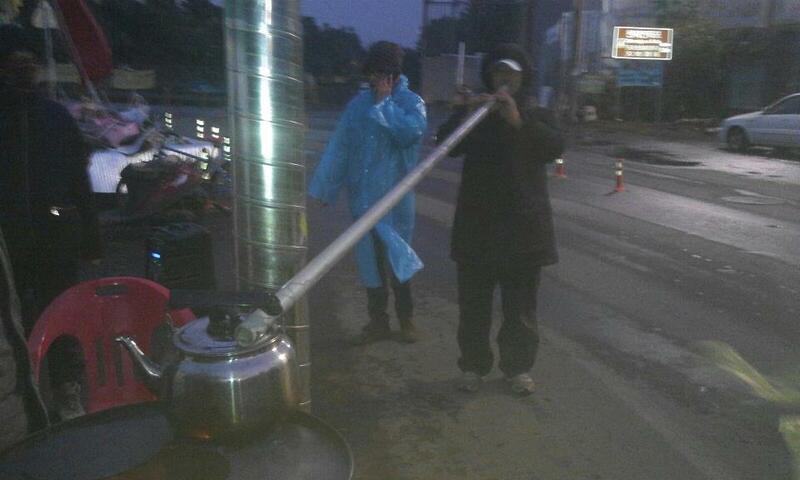 Buddhists plan to cure the village with a religious service for the God of Sea in the port on Dec. 13. 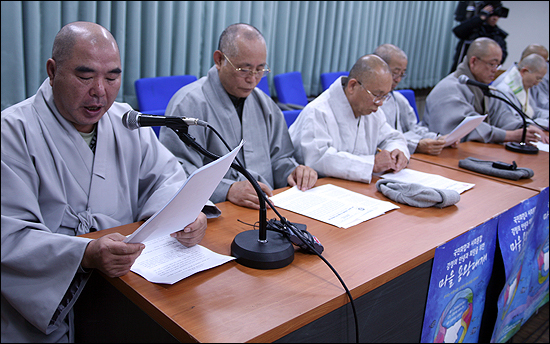 Facing the Presidential election, the Jogye religious order, Jeju Buddhism orders and Buddhists from the Jeju and nationwide will come to the village to console the pain of Gangjeong. The Yongwangje ( a religious service for the God of Sea), the traditional village event, will be featured with the characters of Buddhism this year, as there are many Buddhists in the village. 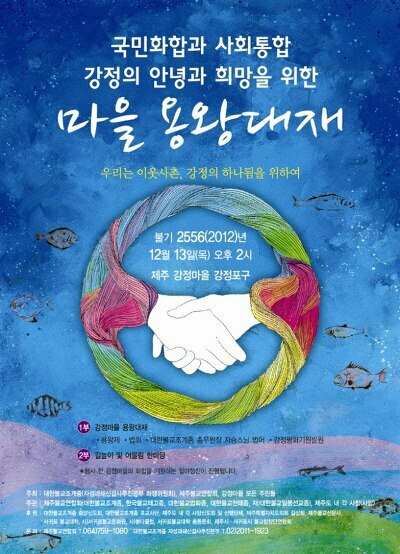 So the name will be ‘Yongwangdaejae’ combined with Buddhism ritual of ‘Jae.’ The event will be held at the Gnagjeong port, people looking at the Gureombi Rock and Gangjeong Sea at 2 pm, Dec. 13, Thursday. Photo source: Pressian, Nov. 5, 2012/ 333 intellectuals from 25 Asian countries made a statement, expressing opposition against park Geun-Hye, Presidential candidate of the ruling Saenuri party. A highly important election will be held in December in a country in Asia, known for its exemplary democratization, South Korea. This election, to elect a new President in a presidential polity, is likely to serve as a significant testing ground for the future of democratization not only in South Korea, but in Asia as well. We intellectuals in Asia who clearly remember the rule by terror of Park Jung-hee and his Yushin dictatorship, think that what is presently happening with the coming election in South Korea lays a dark cloud over the future of South Korean democracy. Contrary to the beautified stories that Park’s followers make and spread, the days of Park’s dictatorship were a series of political crises and Korean people had to suffer from totalitarian control and state violence that resembled the days of Japanese colonial rule.